Talk given on November 15, 1998 at the Danzan Ryu Seifukujitsu Institute of Southern California. This article is entitled “Uncle Bud,” and not “Professor Estes” as he was known to anyone reading this, because I am his nephew, Burl Estes, and that is how I knew him. Tenth Degree Black Belt Francis Merlin Estes was, and always will be, simply Uncle Bud to me. Uncle Bud was very formal and insisted on following protocol in judo classes or seminars. You did not carry on conversations with your neighbor, wander around or take breaks whenever you wished. You listened, learned and spoke only when asked to. Although I’ve attended his classes in Chico, California, this formal man is not the one I remember. In fact, Uncle Bud was a very outgoing man with a great sense of humor. If a student was having difficulties in class, all he or she had to do was pick up the telephone and Uncle Bud was more than willing to help them on a relaxed, informal basis. His interest was in promoting judo and the American Judo Jujitsu Federation. Working full time as a bookkeeper for a well drilling and pump company in Chico, financial profits from judo were probably the last thing on his mind. The only time I recall hearing him discuss finances was when trying to determine what to charge for the GIs that grandma made on an ancient sewing machine at her home. He wore them, Auntie Luke wore them and his students wore them. To understand Uncle Bud’s dedication to judo and the formal way he ran his classes, some information about his background is necessary. To put it quite simply, it was largely formless and shapeless. Anyone living that lifestyle today would be considered to be far below the poverty line and semi-homeless. To start, my Grandfather and Uncle Bud’s father, James Estes, was born in Indianapolis in 1873. To say he was less than a dynamic person would be an understatement. Throughout his entire life he never had a job where he couldn’t see the end of it (i.e. working 30 years for a company for a pension, doing the same thing day after day, was an alien and horrible concept for him). In some way, he was a forerunner of the modern day hippies. In his latter years (he died in 1974 at age 101), he depended upon Uncle Bud and his brothers for support. After Grandma Estes went into a rest home and died, Grandpa Estes lived with Uncle Ivan, dad and Uncle Bud. He had no other means of support. As a historical footnote, my great-grandfather was Francis Marion Estes (born 1833) who was Uncle Bud’s namesake. On August 8, 1862, Francis and his brother James (born 1841) enlisted into Company D of the Indiana 79th Volunteer Infantry Regiment on August 8, 1862. James was discharged in Louisville, Kentucky, on March 25, 1863. Francis was mustered out on June 7, 1865, in Nashville, Tennessee, as a sergeant. My great-grandmother had seven children spread out over a number of years. Dad said that she never saw all seven of them together at the same time and Uncle Bud had aunts and uncles he never met in his lifetime. Grandpa Estes left home when he was 15 or 16 (1890 or 1891), probably with very little formal education, and moved to Salt Lake City where his oldest brother Tom was reportedly the sheriff. I’m checking this out with the Mormon Church who has excellent genealogical records. There he became a teamster (i.e. a man driving a team of horses pulling a wagon full of supplies) and reportedly hauled supplies used in building the Mormon Temple in Salt Lake City. In 1894, Grandpa Estes moved to Jackson Hole, Wyoming, where he homesteaded a ranch and acted as a guide for hunters. One story he told when I was a kid involved hunting. Since most of his stories were tall tales (i.e. in one he was trapped in a box canyon and killed by the Indians), this one sounds halfway believable because I learned very early how much he detested hard work. He said he and a hunting party were on one side of a deep valley when they spotted an elk several hundred yards away on the other side. Kidding the hunters, he told them to shoot it as it was such an easy shot. Before telescopic sights were in wide use, it was nearly an impossible shot. The hunters told Grandpa Estes to take the shot. He did, aimed at the very top of the tree the elk was standing under and pulled the trigger. To his amazement, seconds later the elk fell over dead. The hunters were ecstatic. Not Grandpa Estes. They had to climb down one side of the valley, up the other, dress and quarter the elk, and then repeat the trip back carrying hundreds of pounds of elk meat, the skin and horns. The hunters told Grandpa Estes he was the greatest hunter in the world. He told me he’d never worked so hard in his life. In any event, at some point in time Grandpa Estes married Olive Nathan and Uncle Bud was born in Jackson Hole in 1909, Uncle Ivan was born there in 1912 (the year the Titanic sunk) and dad (also Burl Estes) was born there in 1915. A sister Patricia (i.e. Auntie Pat) was born some years later, but I don’t recall when or where. In 1918 the family moved to Miles City, Montana, where Grandpa Estes had a brother who had a ranch. Uncle Bud would have been 9 years old then and dad would have been 3 years old. They stayed and worked there until 1920 when the family moved again to Sheridan, Wyoming. While life in rural America was pretty primitive and rough in the early part of this century, Sheridan was probably a pivotal point in the forces that shaped Uncle Bud and his outlook on life. Grandpa Estes intended to work in Sheridan for “a while,” but the family was snowed in and they spent the winter there in a tent. Dad, just 6 years old, recalls going to school in a horse drawn wagon until he and his brothers came home with frostbite. Uncle Bud was then 11 years old and that was the end of school for the year for him and his brothers (Auntie Pat was too young to be in school) and they spent their time lying around in a tent trying not to freeze to death. If you think your Sensei is too formal and rigid and classes are sometimes dull, can you imagine what it must have been like for 11 year old Uncle Bud to lie on a cot in a freezing tent during winter in Wyoming with no television, radio or record player? He, dad, Uncle Ivan and the others just huddled under blankets day after day trying to avoid freezing to death. Uncle Bud has never mentioned this time in his life to me, but I suspect that is one of the reasons he loved the Hawaiian Islands so much and made numerous trips there. If you can recall from working out with Uncle Bud or having seen photographs of him, you’ll notice he usually wore black socks while everyone else is barefoot. He was not trying to be formal. He had cold feet, a carryover from the winter in Sheridan. When the snows melted the family moved to Sydney, Montana, where Grandpa Estes used his team of horses to pull a dirt moving scoop for a contractor, another part time job. In 1922 the family moved to Grand Prairie, Canada, where Grandpa Estes worked at odd jobs. Every morning in school the students would stand and sing “God Save the Queen.” However, Uncle Bud, Uncle Ivan and dad would sing the American version of the song, “America.” Needless to say, the Canadian students did not find this especially amusing and dad reported that there were frequent fights in the schoolyard with the elder Uncle Bud trying to protect his two younger brothers. The year 1923 turned out to be another pivotal experience for Uncle Bud. In that year the family traveled to Los Angeles by train and discovered that jobs were scarce. In 1924 they started “following the fruit.” In other words, they became migrant workers, traveling up and down the Central Valley of California picking apricots, peaches, prunes, grapes, cotton and whatever crops were available. Their source of transportation was a well used Model T Ford, not a large vehicle by anyone’s standards. Can anyone imagine what it must have been like for a family of six to travel up and down the state, living in tents and picking crops carrying all their worldly possessions in a Model T Ford? I’ve picked crops when I was a kid (we moved to Santa Rosa in 1954), but that was for pocket change and every night I went back to a secure home. It was also hard work. Uncle Bud was 15 then and it must have been devastating to him. Dad was six years younger, but still recalls the hardships. The family constantly moved and Uncle Bud and his brothers just as often changed schools. They had no permanent, long time friends and everyone worked to support the family. It was a transient existence and it is no wonder that Uncle Bud dropped out of school when he was 15 years old. Until that time he had been a good student and had been getting good grades, but the constant moves were just too much. Incidentally, my father did go on to graduate from high school. By the time he did so he was 20 years old, had gone to 17 different schools and was working part time at night as a janitor. My grandparents told him he was lazy and that he should have been working full time to support them. Grandpa Estes was not much of a father figure for Uncle Bud and the others and is little wonder he took to judo the way he did. It gave structure to his life. The date is unclear, but at some point during the Model T days while they were teenagers, Uncle Bud and Uncle Ivan went bird hunting. I’ve heard at least three versions of what happened, but Uncle Bud took a shotgun blast in his right forearm that almost shattered the bones. He had a lengthy hospitalization, but recovered. If you examine photos of him, you will note he always had a piece of wood held in place on his forearm with an ace bandage. It was needed to support his injured arm. Uncle Bud also suffered from respiratory problems that were also probably attributable to the family life style. For as long as I can remember, he carried a nasal inhaler in his shirt pocket and frequently used it. Neither of his medical problems seemed to affect him while engaged in judo. In 1929 Uncle Bud enrolled in the Salvation Army Training School in San Francisco. He was then 20 years old and I suspect his enrollment was as much a desire to seek security and is was to escape the wandering family existence. In 1931 or 1932 (probably the former date) Uncle Bud was sent to the Hawaiian Islands (they were still a territory then) to serve with the Salvation Army. A year or two after he arrived he married Arlene Hartman and they had two children, Kimo and little Arlene. They divorced in 1935-36 for reasons unknown to me (I wasn’t born until 1944), and his former wife’s new husband adopted both Kimo and Arlene. Kimo graduated from Stanford University at an unknown date and lives in Mountain View, California, while Arlene lives in Sacramento, California. All I remember of them is that in the 1950s Kimo gave me and my cousin Lynn rides around Chico on his motor scooter. Kimo was very nice to me and Lynn in spite of some reported bitterness about the divorce. However, Kimo did visit Uncle Bud in Chico and seemed to be on friendly terms with him. On Oahu, Uncle Bud met Henry Okazaki and took up judo with a passion. He also met Rick Rickerts and studied with him at the Army-Navy Club. Rickerts was a yeoman in the Coast Guard at the time. It was also in 1931 when the family moved to Chico, California. There was a revolt, of sorts, and Uncle Ivan, dad and Auntie Pat refused to continue the former family lifestyle. Grandpa and Grandma Estes bought a house, paid for by my dad and his brothers, and the family finally settled down. Grandpa Estes got a job he really enjoyed, being a night watchman. He could sleep for hours while supposedly guarding his employer’s premises. In 1935 Uncle Bud resigned from the Salvation Army and in 1938 dad sailed to Hawaii on the Matson liner “Lurline” to join him. Contrary to what is printed in his obituary, dad does not recall Uncle Bud ever practicing judo in Los Angeles prior to going to the Hawaiian Islands. Dad said they wintered in Los Angeles when there were no crops to be picked and that he and Uncle Bud went to the Brookland School and Humphries School. In 1938 dad sailed to the Hawaiian Islands on the Lurline. By that time Uncle Bud was working out in Henry Okazaki’s dojo and dad was invited to join them. When I talked to dad recently and asked him about Okazaki’s dojo, his reply was: “What’s that?” He’d never heard the word “dojo” until I asked him about it. He also did not know that the workout outfits were called GIs. He simply told me that they went to Okazaki’s place and worked out in workout outfits. To dad, it was not “Master Okazaki,” “Professor Estes,” and “Professor Rickerts.” As far as dad was concerned, they were Okazaki, Bud and Rick. Unlike Uncle Bud, Okazaki was formal both in and out of the dojo. Dad describes him as a man with a head shaped like an artillery shell and a personality to match. Dad has a great sense of humor and it is to Okazaki’s great credit that he was able to put up with him. Dad also said there was someone who worked out with them who was known as “Applehead.” Dad said he was a Black Belt who was a machinist’s mate in the Navy who worked on airplane engines. Dad said he was very, very good and probably didn’t realize his own strength, the strongest man dad has ever known. A throw from him and dad said that you felt as though you were about a half inch into the concrete under the coca mats they worked out on. Dad is 83 years old now and much slower than when I was a kid, but he was the strongest man I’ve ever known. Does anyone know who “Applehead” was and if he ever became involved with AJJF? Around 1948 Uncle Bud married Auntie Luke. They were a couple born for each other. Making a number of trips to the Hawaiian Islands (I still have a wooden ukulele they brought back for me) they revisited the place where Uncle Bud was probably the happiest in his life. My parents and I lived in Santa Rosa, but made frequent trips to Chico to visit my parents and Uncle Bud and Auntie Luke. When I was younger my parents would leave me in Chico for several weeks each summer so they could get away by themselves. 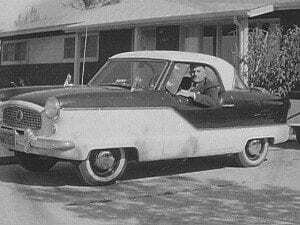 During those times Uncle Bud and Auntie Luke ferried me and my cousins around as my grandparents did not own a car. In 1958 Uncle Bud and three others founded the American Judo and Jujitsu Federation, an organization that is still going strong today. At the 13th Annual Banquet in Oakland (1961) he granted an “honorary” black belt to dad in appreciation for his assistance during the early years. From there both Uncle Bud and AJJF went on from strength to strength. Uncle Bud died doing what he loved to do. 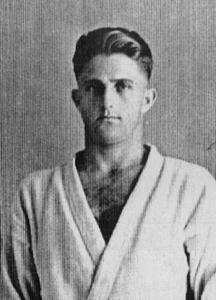 On June 7, 1981, he collapsed and died while giving a judo demonstration in Corning, New York. He was 71 years old. His body was returned to Chico and was buried with an honor guard of his students and black belts. Uncle Ivan and Sensei Lamar Fisher assisted in the funeral services. After he died Auntie Luke lost heart, gave up and died a year later from breast cancer. It was commonly said in the family that she just couldn’t face life without him. I miss Uncle Bud and Auntie Luke and fondly remember them driving me around Chico in the cramped back seat of their Nash Metropolitan, the canoe they kept in their garage for camping trips, the workouts in their dojo, Uncle Bud’s sense of humor, and Auntie Luke’s seemingly permanent smile. I’ve never known anyone to smile so much and be so happy when they were together. They took me and my cousins to swimming holes, movies and on picnics. In addition to the Nash Metropolitan, they also owned a Willys carry all, the forerunner of the modern day sports utility vehicle, they used for camping trips. I recall them heading out with their camping gear in the back and the canoe tied down on the roof. Uncle Bud, Uncle Ivan and Auntie Pat never talked about their early years. It was a taboo subject that was never discussed and it only been recently that my dad can discuss it without bitterness. If asked, I’m sure Uncle Bud described a much rosier picture of family life than it really was. It is dad’s belief, and I’m sure it was Uncle Bud’s also, that he was robbed of a normal childhood and forced into child labor to support the family. Those early bleak years shaped their characters, hardened their resolve and led them on to successful careers – dad as a junior high school math teacher and Uncle Bud as a judo Professor. The early days can be revealed now because most of the participants are dead. Dad is still around, but at age 83 he had a successful career, is enjoying a comfortable retirement with mom and is no longer embarrassed about how he lived as a child. I sometimes wondered what Uncle Bud thought about the early days, but he kept his emotions to himself and was always ready to laugh at something he found to be funny. They may be Black Belts and Professors in Judo to the rest of the world, but they’ll always be Uncle Bud and Auntie Luke to me. He [Uncle Bud] owned a gold mine for a number of years. Located north of Paradise near DeSablo in Butte County, it was in the hills and consisted of several acres of pine trees. There was also a small cabin on the property and an old mining tunnel dug horizontally in a hill. He and Auntie Luke never did any gold mining, but camped there in the cabin and fished in nearby streams. I recall going there as a young boy and teenager, and standing at the entrance of the mine tunnel and staring into the darkness. We were told to never enter the tunnel, which had a small stream running from it, because the shoring timbers were rotten and rattlesnakes liked to lurk in there. Because of my fear of snakes, I never went more than a few feet into the tunnel. Uncle Bud loved camping there and probably would have owned the place until he died, but a local water district took the property through eminent domain and the area is now a lake, the local water supply. It was a beautiful area and I was sad to see it go in the name of progress. My parents, Uncle Bud, Auntie Luke and I visited the area a number of times over the years and one day I’d like to own a similar place. Auntie Pat was born in 1923 in Calgary, Canada, where Uncle Bud, Uncle Ivan and Dad were trying to teach the Canadians the American version of God Save the King. This was where Uncle Bud probably got his first martial arts training or experience. Dad said the first thing newcomers to Henry Okazaki’s Dojo learned was his massage techniques. He swore by them as did mom, who said Dad would give her massages when she came home from work tired and tense from typing all day on the old manual typewriters. Dad claimed that the Okazaki technique of massages was fantastic, better than visiting a chiropractor or soaking in a hot tub. I don’t know why I didn’t ask before writing the earlier article, but when I asked Dad if he had personally worked out with Henry Okazaki, he looked at me and asked, “Do I look that stupid?” He has the great most respect for Okazaki’s abilities and confined his workouts to people such as Uncle Bud, Rick Rickerts, Applehead (see article above) and a Chief Petty Officer who was a cook on a submarine and was known as Muggsy. Sixty years later, Dad cannot recall Applehead and Muggsy’s real names. Dad also said that the coco mats that Okazaki used in his Dojo, which was very popular and always crowded, were slightly more giving than the concrete underneath. Dad said that after the massage techniques, the second thing you learned was how to fall and roll. Then you got into the basics of judo itself. Unlike modern Karate where it seems everyone wants to start breaking bricks in half on the first lesson, Okazaki started building with the fundamentals. Dad is very impressed with the way he introduced newcomers to the sport as a lifestyle and mindset. In short, in spite of the fact that Dad dislocated all the toes on one foot once when he slipped while taking a fall, walking around on his heels for the next week, he credits Okazaki with impressing upon his students the need for physical conditioning, proper training and the need to respect others. Otherwise, Dad says, Okazaki would have simply become a gun dealer and opened up a shooting range. 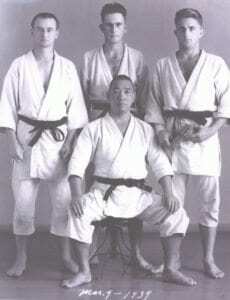 Finally, Dad says that in the 3-9-39 photo (below) of Rickerts, him, Uncle Bud and Okazaki, he (Dad) is wearing a black belt. Dad only made it to Brown belt rank before moving on to join the Salvation Army, getting married, going to college and becoming a teacher. While Rickerts, Uncle Bud and Okazaki were undoubtedly Black Belts, Dad doesn’t have a clue why he is wearing one in the photo. He has seen your WebSite and doesn’t want anyone to think that he was something he wasn’t. Besides, becoming a Brown Belt under Okazaki is honor enough. Had I been old enough, I’d probably be happy now to have become a White Belt working out in Okazaki’s Dojo. Uncle Bud got his name because his younger sister Pat could pronounce neither Francis nor Merlin. Bud was a shortened version of Buddy, a common word in use at that time (i.e. Buddy can you spare a dime? ).